Wonderfully and genuinely warm service from the staff at the lodge who welcome guests to their “home” (the Tembe tribe part-owns the lodge) Overseas visitors frequently remark that Tembe provides the best hospitality in their travels around South Africa! The newly re-furbished tents are simple but very spacious and attractively presented. The highlights have to be the massive outdoor showers which in turn lead through to your own dedicated massage sala set under the trees of the sand forest! 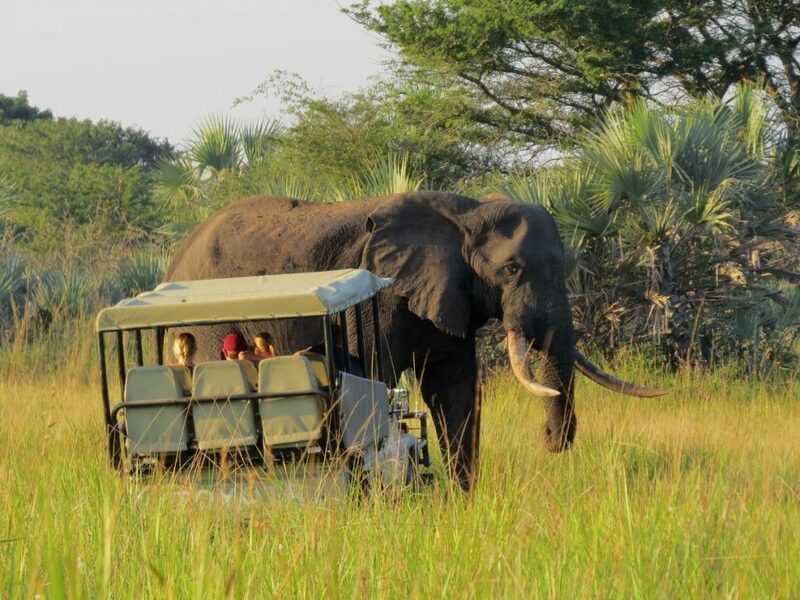 The 30 000 hectare Tembe Elephant Park which lies in the far north of Zululand bordering Mozambique is perhaps one of the least known reserves in South Africa – we’d go so far as to say it’s one of the country’s best kept wildlife secrets which deserves far more attention! Visitors speak in awe of the close-up sightings of the reserve’s large population of elephants which are reputed to be the largest in the world – both in terms of tusk size as well as the sheer bulk of their massive frames. 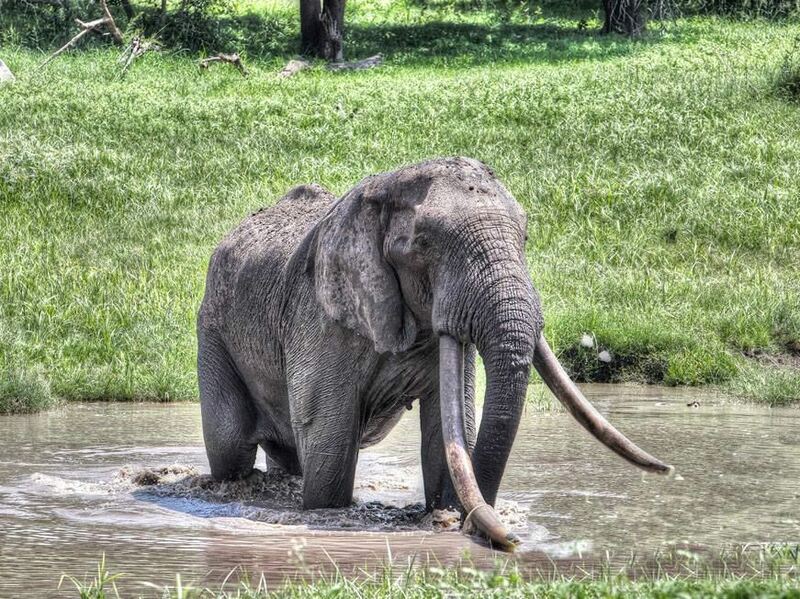 The reserve has boasted many “Super Tuskers” over the years which has seen individual bulls like the massive Isolo (who died of old age back in 2015) become celebrities in their own right. There is just 1 lodge in this public reserve – the Tembe Safari Lodge – other than lodge guests, a limit of just 10 public vehicles are allowed into the reserve daily, which means that the lodge effectively has the scenic expanses of the reserve pretty much to itself. As you travel the sandy roads of the reserve it is noticeable how relaxed the elephants are to the presence of the game vehicles, walking past literally within touching distance on many occasions. But whilst spotting elephant and buffalo is basically guaranteed, there’s a host of other game to be spotted with lion sightings also very common as well as a host of different antelope species (interestingly cheetah and hyena are the only notable absentees as they don’t enjoy the sandy soils) This is also home to some of the best birding in the country with over 340 species spotted here with the summer migrants a huge drawcard for twitchers. The guides’ knowledge of these animals – and their love and passion for the land – is immediately obvious which comes as no surprise as Tembe is their home. 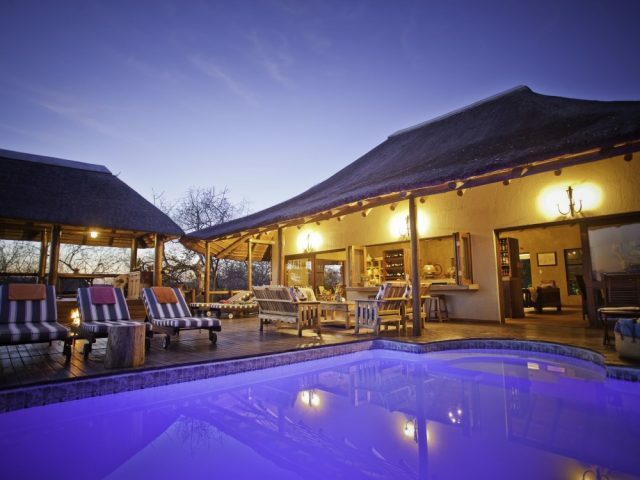 As the only community-owned full-service game lodge inside a proclaimed game reserve, Tembe is partly-owned and fully managed by the Tembe tribe. The guides and trackers who take you around the park grew up here and their enthusiasm is infectious and their knowledge comprehensive. 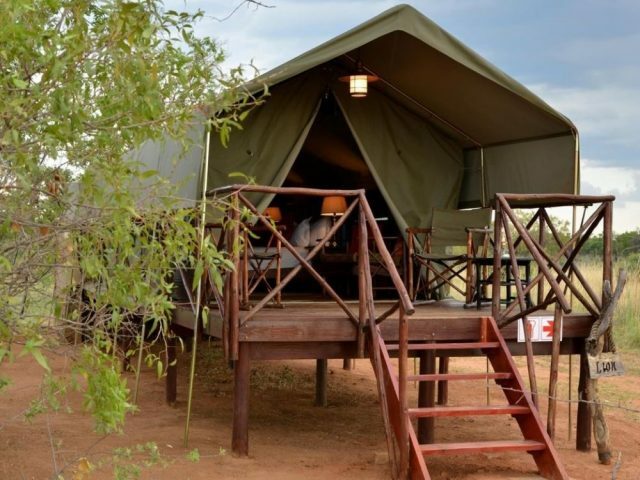 As far as the lodge itself is concerned, the 13 tented suites are located in a sand forest setting fairly close to the main gate of the reserve. Tembe offers 3 choices of tented accommodation and whilst they’re certainly not on the luxurious side of the spectrum like those found at other (much more expensive) tented lodges, they are all very spacious and comfortable (and unusually they all offer at 2 beds and a range of set-ups) For the single-child families out there, the 6 Tusker one-bedroom Suites are a suitable option, with one bedroom containing 2 ¾ beds and space to add an extra bed for a child. If you’re looking for something more spacious the 4 larger Family Suites are perfect for that little bit extra breathing room and with 2 queen size beds and the option of 2 extra single beds they’re great for larger families. 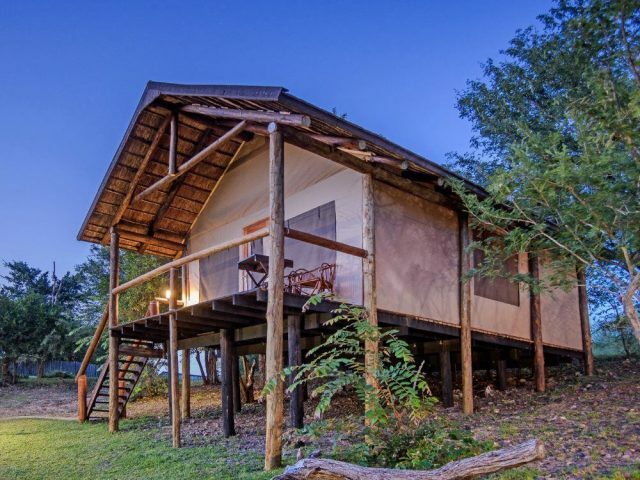 As you would expect at the very reasonable price (Tembe prides itself as being the lowest priced full service private lodge in a Big 5 reserve in South Africa) the tents are fairly simple but actually pretty attractive after they received a recent refurbishment. Recalling the atmosphere of old-time colonial safari camps, the canvas of the tented suites is attractively offset by dark hardwood cupboards and wicker furniture. For us the highlight has to be the outside showers off the back of the tents which in turn lead to your very own massage sala set discreetly under the trees where you can enjoy a pampering massage whilst enjoying the sound of the birds flitting through the forest. Whilst the accommodation is decent for the price, what really elevates the experience of staying at Tembe has to be the wonderfully friendly staff at the lodge. From the welcoming song on arrival to the broad smiles at meal times, the genuine warmth of the staff of Tembe is consistently remarked upon by guests as some of the finest hospitality in the country!